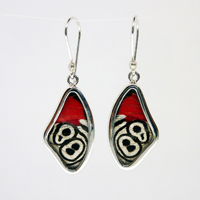 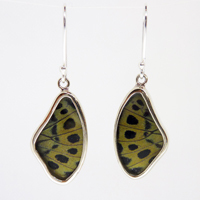 Made from real butterfly wings, framed in 925 Sterling Silver. 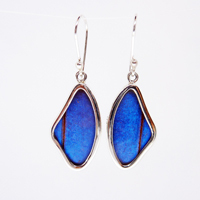 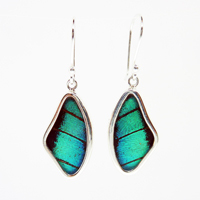 Our wing earring are a larger earring and are available in a selection of colors. 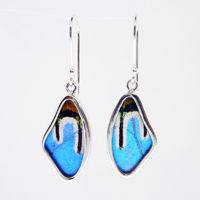 Select individual colors (displayed below), or choose mix colors for our best selection including any 1 of kind earrings! 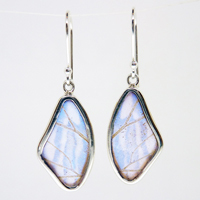 *Also available in a smaller size: the "small wing earrings", which can still be matched to our large "wing pendant"
Materials: 925 Sterling Silver, Real Butterfly Wings, Acrylic glass. 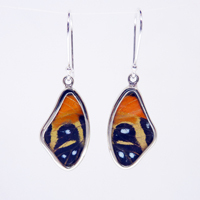 #111: Marble: (Species: Dione Moneta/Gulf Fritillary) Shimmering silver spots, browns and hues of red/orange. addition of color to the Malachite.